As we have learned in part one, the causes of pimples include the blockage of hair follicles by improperly cleared dead skin cells; followed by swelling as over-produced sebum packs up behind the blockage; subsequent bacterial infection; and finally puss created by our white cells as they try to fight the infection. That’s how you get a pimple. Being “dirty” and having poor hygiene is not a cause of pimples. Pores are blocked from the inside, not the outside. All the scrubbing in the world won’t help and will probably make things worse. If you want to find out how to take care of your skin to minimize your acne, read my skin care tips article here. In Part One we talked about the problem of targeting bacteria and why that was a waste of time for all but the mildest acne sufferer. The other traditional treatment method, and one which is more effective in my opinion, is targeting the overproduction of sebum. Even though the sebum itself does not cause pimples, the build-up of sebum behind the plug of dead skin cells causes the follicle to swell and then bacteria feed on the sebum and make the problem worse. Reducing sebum production has been shown to be a very effective weapon against acne. Accutane is the best known drug used to reduce the production of sebum and is hailed by the medical profession (and many former acne sufferers) as a miracle drug. I think that Accutane has its place in the treatment of serious acne that fails to respond to other treatments, but I think it should be used as a “last resort” due to the many serious side effects that come with using such a powerful drug. And those side effects are serious. Fair warning. After failing to clear my acne for years with every antibiotic under the sun, I took Accutane. Although I was prepared for some of the side effects and had my blood tested regularly to make sure my liver wasn’t harmed, my biggest disappointment was that my acne actually got worse for six months and it took an entire year for my face to be completely clear. I also had to endure extremely dry chapped skin on my face and especially my lips. It really hurt my social life as i did everything I could to avoid going out in public. For six months! I was in college and if I had known I would have worse skin for six months I probably would not have taken Accutane. At that time there were no alternative treatments available, but now that there are some alternatives which many find effective and quick, I would try those before going with a harsh treatment like Accutane. 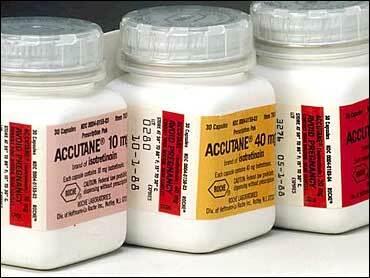 If you can hibernate for six months and everything else has failed… Accutane may be for you. I won’t recommend it, however, because the risks are serious and you should do your own research. I still get the occasional pimple but not nearly as frequently as I did before my Accutane treatment – usually only when I am coming down with a cold or extremely stressed out. What? Does that mean that getting sick and stressed out is one of the causes of pimples? Yes, I am saying that. But why? The key is that stress, getting sick and even your diet can affect the real root cause of acne – hormones. When we discussed the problem of faulty clearing of dead skin cells in hair follicles (part one), we discussed how this problem was related to hormone imbalance. More specifically to the production of androgen hormones. Hormones are certainly influenced by diet, stress and many other factors. The point is, while there is no direct cause/effect when it comes to food, what we eat certainly affects the processes that cause acne. Correcting those processes has helped some people to beat pimples at the source. It’s this “blind spot” in medicine that opens the doors to other acne fighting methods that seem to work better than traditional treatments by getting to the root of the problem instead of focussing so narrowly on the hair follicle itself. 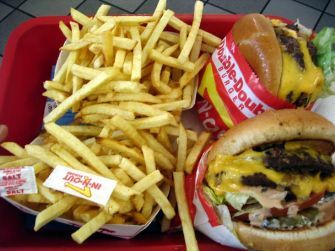 The bottom line is if you notice that you get a breakout after you’ve been gorging on certain foods (burgers and fries?) try cutting them out of your diet!